A galactic empire has fallen… and a secret directive rings throughout the new order of the stars: kill all the humans. Jaqi is a nobody, a simple navigator with a trick to finding little-used hyperspace routes. She never expected to save important political prisoners, given that said prisoners are just human children. She never expected to run from the full military might of the galaxy’s new masters. Now, she and her charges must survive as they flee across a galaxy in flames, and Jaqi must ask herself whether she has the strength to fight the darkness in the wake of war. 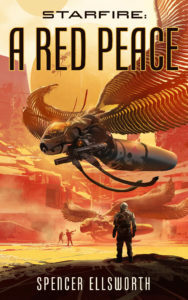 A Red Peace left Jaqi and Araskar fugitives- the Resistance, the Empire’s remnants, and the insectoid Matakas want them dead, especially now that John Starfire’s upped the price on their heads. 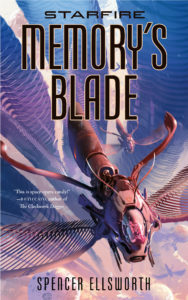 Nowhere is safe, but Araskar has a secret, and he uses it to make a deal with the Matakas. 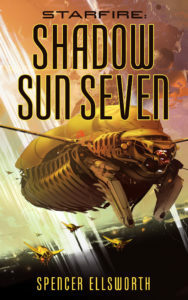 From the stolen high-level intel in his memory-sword comes a name: Shadow Sun Seven. An impenetrable prison in the heart of a giant space tick, holding a top-secret prisoner who knows John Starfire’s secrets. In an ancient Jorian temple, Jaqi faces John Starfire. He has set all the worlds aflame in his quest to destroy humankind. Jaqi has sworn to stop him. Problem is, Jaqi isn’t much of a fighter. And the sun-eating cosmic spiders, the Shir, have moved out of the Dark Zone and are consuming the galaxy. Araskar must hold them back, but to do that, he has to give himself over to the Resistance, commanded by John Starfire’s wife. She may him dead more than she wants the stars to live.